mama elephant | design blog: #CELEBRATING4YEARS WITH ME PREVIEWS! Hi friends! It's October 1st! You know what that means, right?! Happy birthday to ME! We are #celebrating4years of Mama Elephant this whole month with you! Wow, four years just flew by like that! We are truly, truly, truly grateful for all your support the last four years. We are so happy and humbled to be in a position where we are able to deliver inspirational products to you year after year. Thank you for allowing us to do what we love the last four years. Let's keep going for a long time together, ok? We have our live event in NYC today! So excited to hang out with our friends again, old and new! It's truly a fun and festive event every year that we look forward to. If you're at the event, please come up and say hello. :) If you can't make it to the party, don't fret, we will continue the celebration online. Stay tuned! Let's kick things off with PREVIEWS! It's our biggest release of the year, so we are starting it 10 days early! We have 9 new stamp sets and 9 new creative cuts dies... andddd some exclusive offers we will announce later. ;) It's beginning to look a lot like Christmas around here! 10/15 ~ Worldwide release at 12:00 EST! In no particular order or anything, here we are with the Stamp Previews! First one up is Wooly Winter, sort of a follow up to Angela's wildly popular characters like last year's knock-out hit, Reindeer Games. Do you recognize this fellow? He's from Lunar Animals and he's here along with his buddies to help you celebrate all things Winter! 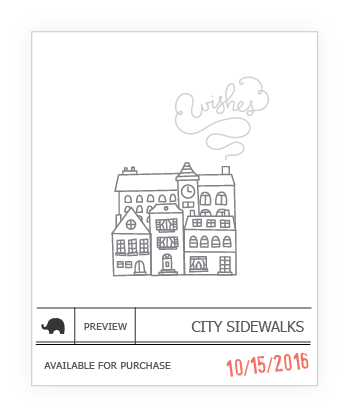 City Sidewalks is a whimsical and charming cityscape stamp set that is loaded with lots of little elements to add your own charming spin to it! My favorite is the script smokes! This set is so much fun to color! Luli Bunny is introducing another awesome set just in time for Christmas! 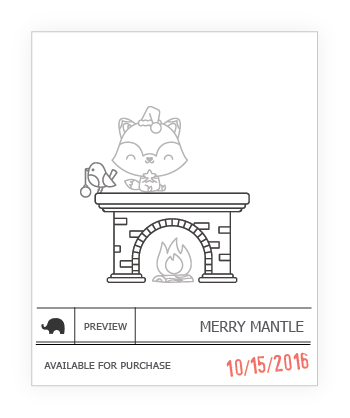 Take a peek at Merry Mantle! She's got a few pals to create the coziest holiday scene with mantles and loads of fun additions to dress it up! We have a brand new in-house stamp designer joining us starting with this release. Here is her first offering of beautiful poinsettias, the perfect holiday floral for amazing holiday elegance. We'll introduce her a bit later! With this, we are starting a new line called Floral Series (FS for short). 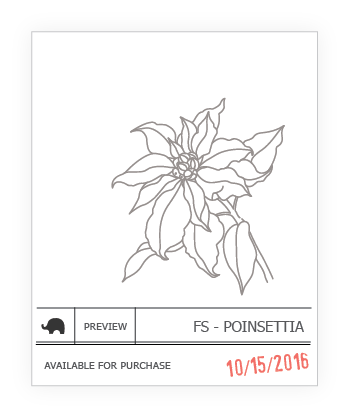 This one is called Floral Series - Poinsettia. So excited for all the beauty that is yet to come! I bet you're all stoked that our very own Pamela Ho is bringing back her beloved Pix for the holidays! 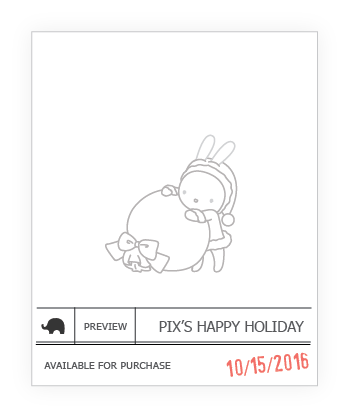 Pix is cuter than ever before in Pix's Happy Holiday and in the merriest of moods! The images created by Pamela are absolutely darling! 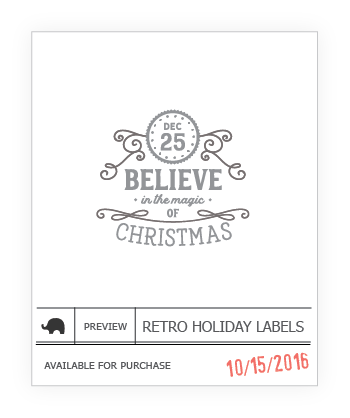 We are adding a fun new sentiment/image style set perfect for the holidays called Retro Holiday Labels. These labels are perfect for a stylish sentiment to finish off a card or they are great as focal points on its own. Even better, they're perfectly suited for tags! I'm super excited about O' Tiny Tree! You know how sometimes you envision something in your head and then pray that it gets executed just like you've imagined? Well, this is it! I love, love all the building details we came up with in this set to truly make that cute little tree unique! 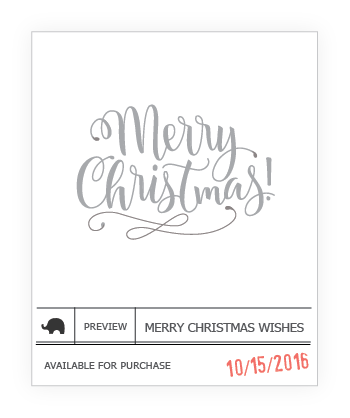 We are bringing you more of Paola's beautiful hand lettering in Merry Christmas Wishes! Such an elegant showstopper that's perfect as center stage for your holiday cards this year! 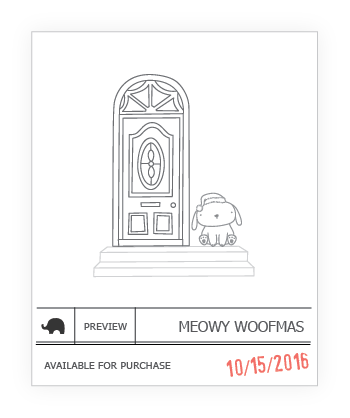 Last but not least, for the stamps previews anyway, is Meowy Woofmas. You will LOVE the interactive feature of this set, the coordinating die cuts are a must to really get the full effect of this whimsical set! It's my favorite, I'm also biased since it's by yours truly, but yes, it's my favorite because there's a little story behind this which will be revealed later when we get to Intros! Well, that's it for the Stamp Previews! We have quite a bit more stuff up our sleeves and can't wait to show ya! We've worked really hard all to bring you this fabulous release, so stick around, comment and give us your feedback the next two weeks as we lead up to the official release date - October 15, 2016! Lots of fun details to come! Lovely release ! And a very Happy Birthday ! I've been waiting for this release!!! It looks amazing!!! I can't wait to see projects using all these great new products! LOVE! I'm excited for the DT previews. REALLY love tiny tree and the magic of christmas ones. I've been so excitedly waiting for your release.I always love your products.Can't wait to see the CREATIVITY. Hugs from Florida. Happy 4th Anniversary! Your company is soooo popular and successful!! Congratulations! 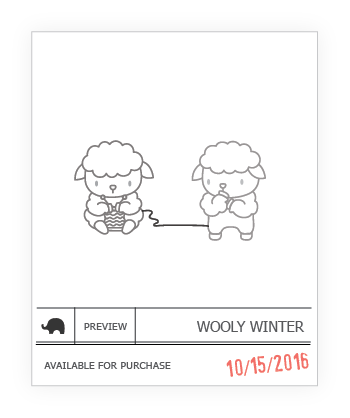 Plus the little sheep knitting from the other sheep cracks me UP!!!!! Happy Birthday!! LOVE the new stamp sets coming out. I am so excited!! Congrats on four wonderful years! The peeks look amazing. 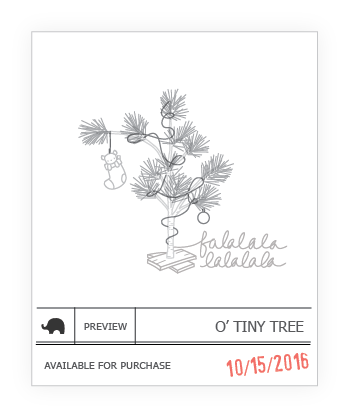 I'm sure Tiny Tree will be a must-have--well, along with a few others!! Love me some Mama Elephant, looking forward to the new reveal. Many cute things here, but I love th Wooly Winter. Such a cute idea. HB2UME!! Happy four year anniversary!!!!!! So excited for you!!! I'm glad I got to see you at the party!! WOOHOO!! Oh, this looks way too exciting. Be still my wallet! Happy birthday and so glad to see the new release peeks. Happy Fourth Birthday! Congratulations on another great year! Those sheep are hilarious and I love the little Charlie Brown style tree! You have such cute characters! Happy 4th Anniversary Mama Elephant!!! Happy 4th Birthday ME! These sneaks are all so wonderful!!!! I cannot wait to see more! Very exciting!! Super cute sneaks!! Happy Birthday!! Congrats on your 4th Anniversary!!! Cute new stamps! Been missing your blog posts, hopefully will see more soon! Happy birthday to Mama Elephant and all her critter children! I love this release and can't wait until the 15th! Wow! So much goodness coming out?!? Can't wait to see the full reveals and I'm so happy I have a bday coming up - I know what I NEED for my bday :):). Congrats on 4 years! I've only found ME recently, however I adore your stamps/dies! Happy 4 years! Looks like this will be a fabulous release! you made my 4 years so much gleeful! Thank god for you all! Happy anniversary!